Is your spouse hard to buy for? We have the perfect Christmas gift! Is your spouse hard to buy for? Does he or she have a hobby or interest that they just love but they’re so particular that you could not possibly pick out something for them as a surprise? Are they the type that would be so happy over a cash gift but so responsible they’re probably use it to pay for gas in the car over the next week? Would he or she love picking out their own gift but just for once you want to give them a surprise? We have the PERFECT gift for you! What about buying a perfect set of LED Christmas entrance lighting items for your front door for Christmas? Our holiday lighting is featured in all the top catalogs. If your spouse did research for the best holiday lighting to adorn your front door or front gate, this is the lighting they would find. Hmmm. Let’s face it. If you get her a reciprocating saw for the “home”, you won’t get away with that. If you get him a place setting of your formal china, will he see that as not really a gift you can both enjoy? Make sure it’s something that will be used equally by both spouses. Make sure it’s something that has that “ooh ah” effect that makes each of you smile and warms your hearts. Make sure it has staying power. You don’t want that gift that will be appreciated for the first month and then never used again. Most importantly, make sure that moving or taking care of the gift doesn’t cause any work for your spouse. Imagine this. Imaging you have a gas fireplace that you’ve never hooked up for some silly reason. Imagine you hook up the gas and secretly have the gas tank filled in time for Christmas. Then right before you break out the first ornament or realize you forgot to buy ornament hangers, you crank up the gas fireplace. Christmas cheer is remembered for years to come. Warm family Christmas cheer is a priceless gift. So we have a couple of options for you. Our Christmas decorations bring that same warm feeling of cheer as that warm yellow fire in your fireplace. Our LED Christmas lighting collection includes decorative accents, architectural home lighting and decor for your yard. A perfect smaller Christmas gift is a set of decorative accents for your entrance. This includes LED lighting garland, 2 slim Christmas trees illuminated with LED lights to adorn the entrance and a lighted wreath for your door. Our architectural home lighting is our biggest seller. The lights line the roof line of your home. They, again, are all LED. We do all the installation for you. We also take them down at the end of the season and we even store them for you. So, this family gift will not create any work at all for your spouse. Our decor for your yard is your third option. We everything from lighted candy canes and North Pole posts to decorative snowflakes, lighted Christmas gift boxes or hanging illuminated colorful ornaments. 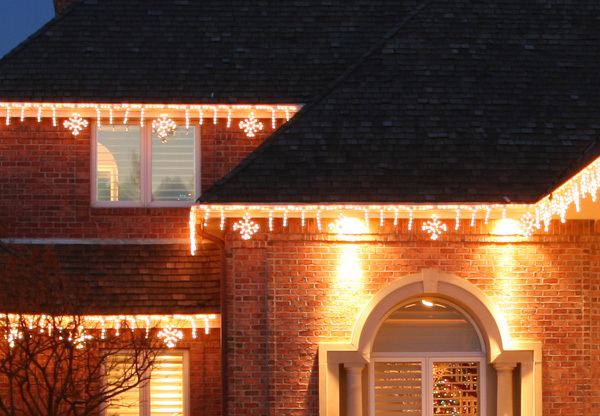 Give us a call now so we can give you a quote for your holiday lighting. We’re happy to work around your schedule if you want it to be a surprise. This entry was posted in Holiday Gifts and tagged Christmas lighting Nashville, Hank Baskett surprised Kendra Wilkinson with Holiday Bright Lights, Holiday Gifts, holiday lighting as a gift, holiday lighting Nashville, LED Christmas lighting Nashville, LED holiday lighting Nashville, Nashville Christmas Lighting, Nashville holiday lighting by outdoorlightingnashville. Bookmark the permalink.